Are you afraid to smile because of embarrassing gaps and spaces in your teeth? If you have missing or damaged teeth, a denture might be the right choice for you. At Dental Health Group, we can custom design a denture specifically for your needs. A denture that fits comfortably and looks natural will make your smile more attractive, help you eat better and have a very positive effect on your health. Dentures – What are they? A denture is a removable appliance used to replace missing teeth. Did you know that when you lose a tooth, the surrounding teeth will shift apart and create large gaps between your other teeth? Missing teeth can also cause your facial muscles to sag, making you look older and affecting your ability to talk and eat properly. Dentures are very important because they prevent your teeth from shifting and creating those unsightly gaps. Full dentures are designed for people who have lost all of their teeth. 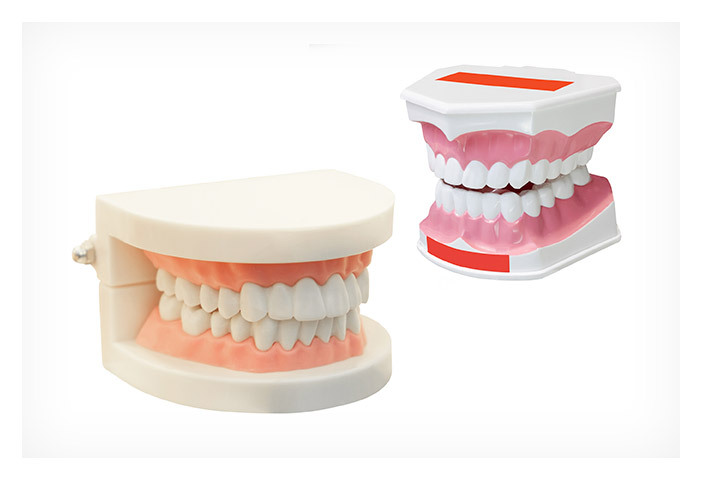 These custom dentures are precisely moulded and created to securely fit your mouth. Held in place by strong cheek and mouth muscles, full dentures will keep your jaw properly aligned and will increase your chewing power significantly. Partial dentures are often one of the easiest ways to replace missing teeth. These dentures are held in place by discreet clasps that can be customized to match your existing, healthy teeth. Partial dentures are quite comfortable and will increase your speech abilities and strengthen your bite. They will also dramatically improve your smile so that you can look and feel your best every day! Implant supported dentures are becoming more popular as implants help stabilize loose dentures and allow better comfort and chewing function. While a regular denture rests on the gums an implant-supported denture is a type of overdenture that is supported by and attached to implants. You will find that an implant-supported denture is mainly used when there are no teeth in the jaw, but enough bone in the jaw to support implants. At Dental Health Group your health is our primary concern. Don’t forget that over time your mouth gradually changes and your denture may need to be re-adjusted to maintain that perfect fit. If you are considering full or partial dentures, please contact our friendly staff at Dental Health Group to book an appointment today!